Hi! 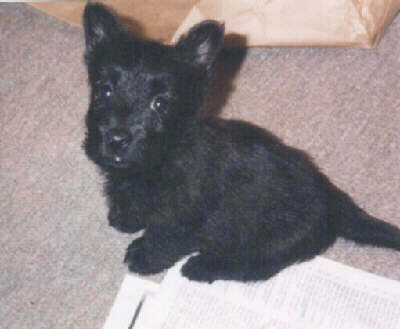 I am called Midget, and I am a Scottish Terrier grrly-grrl. This is one of my first baby pictures -- my Mom likes to show this one off to everyone! She even has it hanging in her cubicle at work. (Whatever a cubicle is....) I was born on January 29, 1999, so I am an Aquarius. 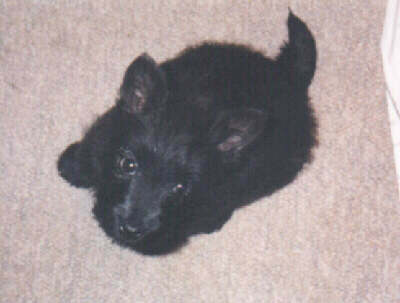 I am 7 or 8 weeks old in this photo. This is my second favorite sleeping position. Don't I look like a bison or some other animal? I am about 8 weeks old in this photo. Don't I look totally sweet and innocent here? (NOT! 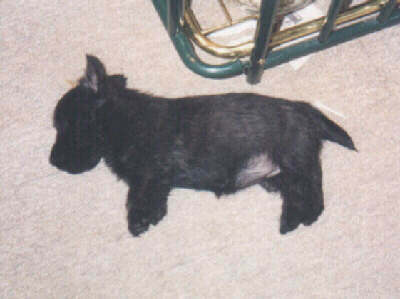 I AM a Scottie, after all.) I am about 7 weeks old in this photo. My registered name is bigger than I am.